Gostiny Dvor is the oldest trading company in St. Petersburg, whose history is connected with many important events of the Northern capital.Gostiny Dvor is a monument of architecture under the protection of the state; it is one of the symbols of the city on the Neva. What explains the preservation and prosperity of this ancient enterprise that has been trading for over 200 years, notwithstanding at all peripeteias of life?The answer is simple - this is the location in the heart of St. Petersburg and the large flow of tourists, architecture and history, associated with the names of many famous personalities. Gallery of High Fashion works daily from 10-00 to 22-00. Despite the fullness of brand clothing, nice goods at an affordable price in the mall are still meeting. The building occupies an entire section and looks like an incorrect quadrangle formed by such streets as Nevsky Avenue, Sadovaya Street, Perino Line and Lomonosov Street. The front part of the building overlooks Nevsky Prospekt, this is the Nevsky line. On its first floor you can buy souvenirs and many goods for tourists. Also here brand shop of football team Zenit is located. Men's clothing is sold on the second floor of the Neva line, on the second floor along Sadovaya Street - women's clothing.On the other two lines - Lomonosov and Perino - there is a variety of shops, from ready curtains to radio goods. 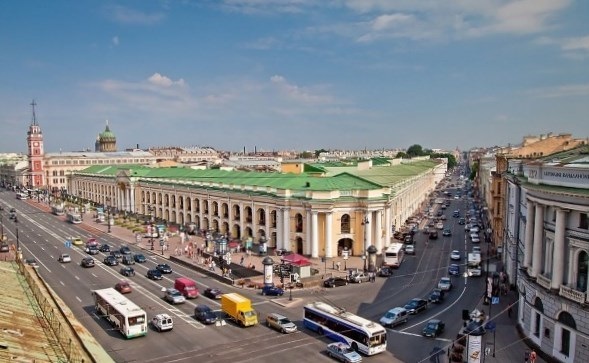 At present time, Gostiny Dvor represents almost two million products.Trade halls have a length of about two kilometers and offer to customers products of more than three thousand Russian and foreign firms with an assortment of about 170 thousand kinds of goods. The high fashion gallery was opened in 1998.At that time, the collections of the most prestigious couturieres of France, Italy and England were exhibited here.At present time, about 40 world brands are represented here.The trade complex carries out the gala shows as "Fashion of White Nights on Nevsky" and shows of new collections of high fashion in the best halls and palaces of the city. The creation of a historic building is associated with the names of five famous architects. The plan of the building in the form of an incorrect quadrangle was still performed at the time of Anna Ioannovna by Peter Eroshkin, the chief architect of St. Petersburg, who was the first who created the general plan of the city. The first wooden benches along the Nevsky Avenue were built in the 1740s.The decision to build a one-storied rock trading building instead of wooden buildings was made in 1748. In the 1750s Antonio Rinaldi and Bartolomeo Francesco Rastrelli worked on the project of the building, but the projects of both architects were rejected.In 1761, Catherine II invited to France a French architect Jan Batist Wallen-Delamot.According to his project from 1761 until 1785 the construction has been building.Completion of building became a significant event in the history of Russian architecture. It was the first building in St. Petersburg, created in the style of early classicism.Its perimeter is more than one kilometer.Everything was made of stone and iron in it to avoid the fire.Even the heating of the benches was prohibited and only in 1837, a pneumatic furnace was equipped in the building. In 1842, instead of obsolete oil burners in Gostiny Dvor, gas lamps were installed, which attracted the citizens of the city, walking in the evening along Nevsky Avenue. In 1885-1886 a building façade was rebuilt in accordance with the project of architect and artist Albert Nikolaevich Benois, in the result fretwork and sculpture had appeared on it and a dome was installed on the main building. Folklore reacted instantly on the change of the usual classical view of the facade of the Gostiny Dvor, calling an unceremonious intervention in the design of the architect as "Benoîv remakes". Only during the post-war reconstruction the original appearance of the facade was returned. Gostiny Dvor becomes a landmark of St. Petersburg, as well as a place of entertainment and leisure, where its customs, laws and customs reigned. Dignitaries and nobles, students and artists, writers and poets visited trade rows.Here Ivan Krylov, Alexander Pushkin and Nikolai Gogol walked.In those days it was said that the Gostiny Dvor "always sets the tone." In the usage of the citizens, the expression "Gostinodvorskaya galantereynost" appeared, denoting the lively and sympathetic pursuit of the sellers, which, incidentally, did not rule out their rudeness. They told a story about sellers of ties and cakes. One of the buyers of cakes expressed his displeasure with the piece of rag found in the stuffing, in response from the seller he heard: "And to you for three coins with velvet, or what?" In order to protect the interests of merchants, the security of shops and for maintenance of clean rooms, the Committee for the government of Gostiny Dvor and the hospitality chief were elected. Gostiny Dvor was a city in the city, with its offices and pantries, arranged in the upper galleries, and wholesale warehouses in the inner building. During the revolutionary events windows of benches were closed by boards and trade ceased, but most merchants hoped that Soviet power would not last for a long time, and therefore many of they hid their savings in their shops. One of these treasures - three gold bars were found in October 1965. Also during the big repair of the facade of the Perino line in 2003-2004 a treasure of gold and silver coins of the middle of XIX century was found. Gostiny Dvor from ancient times actively has been replenishing the urban folklore. So, in Soviet times, expressions like "Blue Hall" have appeared; "Blue Hall" is the famous secret department, where party personalities and representatives of local authorities dressed themselves. Galera is the gallery of the first floor of the Lomonosov line and the second floor of Sadovaya and Perino lines, where Leningrad spivs and shopkeepers had gathered. At the right entrance from the side of Nevsky Avenue there was a five-copeck place, where one could see the clumsily dressed girls of the causative appearance, which in a certain environment were called "five-point prostitutes". Gostiny Dvor in St. Petersburg is not only a trading center with a huge list of goods and services, but also a meeting place and communication.You will be pleased with the festive atmosphere, concerts and circus performances, competitions and exhibitions.